These bits fit many soldering irons that have a hollow shaft and require a solid tip. 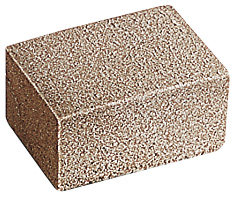 Pre-cleaning Abrasive Block. Removes finger-prints, smears, oxidisation and unwanted marks from PCBs prior to etching. Ensures a sharp and accurate resu;t. Many other electronic uses, including removing markings from semiconductors for circuit secrecy and security.